What’s wrong with a little comfort food on a cold, dark, winter evening? Absolutely nothing (especially if it includes colourful fruits and hot custard or fresh cream.) Winter was made for puddings. A few minutes-and the following ingredients-are all you need to make a simple tasty topping for the seasonal fruits you fancy. Serves 4-6 people. Just sift the flour into a mixing bowl and add the diced margarine. Rub the two ingredients together with your fingertips until all the margarine has been mixed in thoroughly. Next, add the caster sugar and stir it in well. This combination is now ready to spoon onto your chosen fruit. Once the topping mixture has been spread over the fruit, press it down firmly with the back of a spoon and then sprinkle the Demerara sugar on top before baking the pudding. Prepare the fruit according to type then arrange it in a pie dish. Either sprinkle with a little sugar and add a couple of tablespoons of water, or use 2 tablespoons of fruit juice to sweeten the fruit and provide a little extra moisture. Bake the prepared fruit crumble in a preheated oven (200C) for about 45 minutes. Check that the fruit is soft and the topping looks crunchy and golden before serving with custard or cream. Cut the apples into chunky slices and arrange half of them around a pie funnel in a pie dish. Sprinkle the sugar over the apples, before adding the remaining half to the dish, with 2 tablespoons of water. Next, roll out the prepared pastry and cover the pie with it-use pastry trimmings to decorate the top of the pie. Brush the pastry with milk and make a small slit in the centre of the pie to let steam out. Bake the pie on a baking tray in the centre of a preheated oven (200C) for 30-40 minutes. 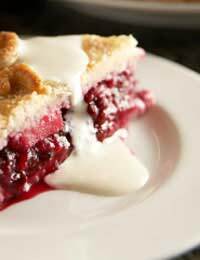 Canned black cherries are OK to use for this recipe as long as they are well drained. Use the prepared pastry to line a 24cm fluted flan ring then bake ‘blind’ in a preheated oven (200C) for about 15 minutes. Remove from the oven and turn down the temperature to 170C. Arrange the cherries evenly in the pastry case. Next, mix the sugar, eggs and almonds together in a bowl and add a few drops of almond essence, then pour this mixture over the cherries and return the dish to the oven for about 1 hour. The top should look firm and golden after this time. Serve this immediately with custard or cream or leave it to cool and eat it cold with whipped cream.